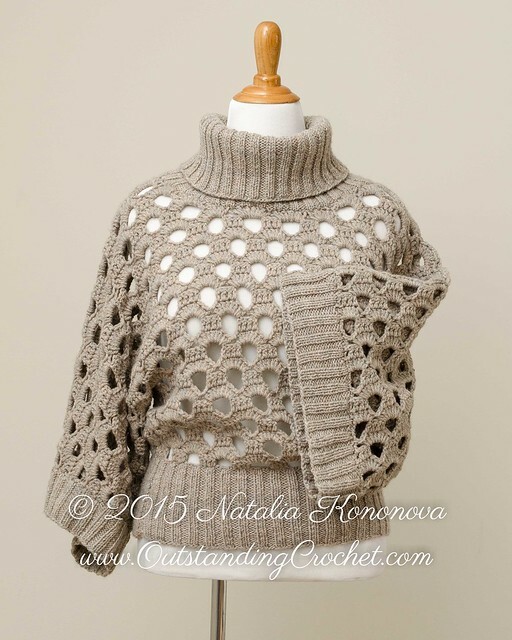 Outstanding Crochet: New crochet&knit sweater pattern - Turtle neck - Kimono sleeves - Seamless. New crochet&knit sweater pattern - Turtle neck - Kimono sleeves - Seamless. Follow by e-mail to receive free patterns, tutorials and new patterns in the shops announcements (right upper corner). Follow my Pinterest Crochet board to see all crochet images I pin . Turtle Neck Seamless Crochet&Knit Sweater. If you love knit and crochet, this pattern is for you! Wear different color tees underneath honeycomb stitch pullover. Kimono sleeves, seamless construction, worsted weight yarn make this pullover fun to make and wear. ch (chain), sl st (slip stitch), sc (single crochet), dc (double crochet), tr (treble crochet), dtr (double treble crochet). - 4 mm - 32'', 3 mm - 24''. - 6 (7, 7, 7, 8) skeins of worsted weight (#4) yarn; shown here – Patons Classic Wool Worsted in Natural Mix color (100% wool, 3.5 oz/100 g/209 yrds/192 m). - Small (Medium, Large, 1XL, 2XL)/34 (38, 42, 46, 50)''/ 86 (96, 106, 116, 126) cm in bust circumference. - 2 repetitions of honeycomb stitch (see instructions and chart) x 5.5 rows = 4 x 4'' (10 x 10 cm). Hook 4.25 mm. - 2 x 2 rib knitting stitch on 4 mm needles: 18 sts x 27 rows = 4 x 4'' (10 x 10 cm). Make bottom band first using bigger circular needles. Bind off all stitches and start crocheting sweater body in rounds until reaching adding sleeves point. From there keep crocheting front of the body alone with front parts of sleeves until reaching neck opening. Crochet right shoulder first, fasten off, join yarn and finish left shoulder. Join yarn to complete back of the body alone with back sides of sleeves until reaching neck opening. Crochet left shoulder and connect to front in last row as you go. Proceed to sleeve band without fastening off. Join yarn and finish right shoulder, connecting to front in last row as you go. Do not fasten off, proceed to another sleeve band. Using bigger, then smaller circular needles, make turtle neck.